This infographic was sent to me by subscriber, Bre Matthews. I think it’s interesting how the greenest states are mainly clustered. I wonder if this is because resources are clustered or if bordering states are “pressured and or inspired” to be as green as their neighbors. What do you think? Sooooo this graphic has inspired me to post the first give away of the New Year. After all who doesn’t like trivia (and free stuff). To enter, simply respond to the following question by leaving a comment. When did LIFE University’s recycling program begin? Everyone who responds with the correct answer will be entered in a drawing to win this ECO Bookbound Journal.Entries must be submitted by Friday, January 20, 2011. Christmas Trees: Artificial or Fresh???? 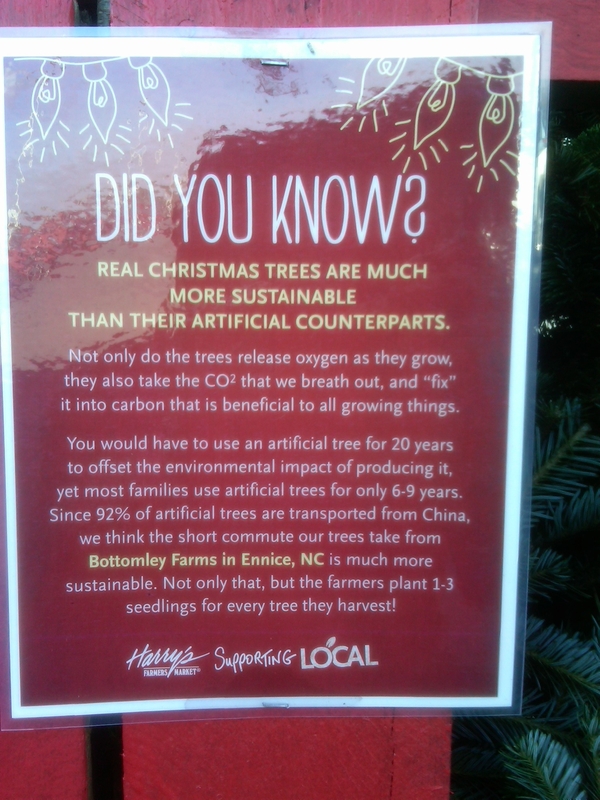 I saw this sign at Harry’s Farmers Market and thought it was worth sharing! Fluoride in Tap Water…Good or Bad??? Emagazine.com features an “Earth Talk” column which answers questions about the environment. A Sustainable Life will occasionally share some of these Q&A’s with you. 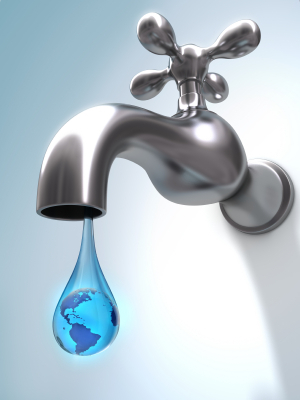 Dear EarthTalk: So, what’s the story: Is it good that we have fluoride in our tap water or not? I’ve heard so many conflicting opinions over the years. The debate over whether we should add fluoride to public drinking water has raged since the 1940s when American cities first initiated the practice as a way to fight the scourge of tooth decay. The benefits of more research and hindsight in recent years have led many policymakers to reconsider the merits of so-called artificial fluoridation. The U.S. Centers for Disease Control (CDC) reports that today over 60 percent of Americans get fluoridated drinking water from their taps whether they want it or not. Critics of the practice worry that we are exposing ourselves to much more fluoride than is necessary to fight tooth decay. So what’s the risk, anyway? According to the nonprofit Environmental Working Group (EWG), over-exposure to fluoride can be toxic, causing dental fluorosis (mottling and loss of tooth enamel) and skeletal fluorosis (joint pain, stiffness and bone fractures). Proponents of fluoridation argue that the benefits of adding it to drinking water far outweigh any potential risks. Various studies have shown that fluoridating drinking water can indeed lead to as much as a 40 percent reduction in cavities in populations of both kids and adults. But studies in other areas that do not artificially fluoridate—such as throughout most of Europe—have shown similar improvements in recent decades, perhaps thanks to increased attention to teeth by family and school health care practitioners. You can check if your water is fluoridated, and if so, how much, via the CDC’s My Water’s Fluoride website. If it is, you can also invest in a filter that removes it. However, they are not cheap: Countertop water distillers go for $200 and up, and an activated alumina defluoridation filter—most come in cartridge form and can be placed in-line under counters—are costly, too, and need to be changed out frequently. FilterWater.com, among other sources, has a wide range of choices available for sale. Unfortunately, the most popular and less expensive home water filters, like those from Pur and Brita, do not remove fluoride. Meatless Monday update: I successfully completed my first Meatless Monday. Oatmeal for breakfast, veggie pizza for lunch and veggies for dinner (leftovers from Sunday). Not bad (If I must say so myself) for my first attempt at a day without meat. A couple people suggested that I focus on what I could eat, rather than would I couldn’t eat and that really made the difference for me. I’m actually looking forward to next Monday! The 2011 NBA season will be a little more eco-friendly as they have unveiled a new lighter, faster-drying jersey made from 60% recycled materials. 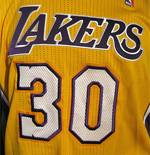 The new jerseys are part of a system called the Revolution 30. Not to be outdone by the NBA, the NFL’s N.Y. 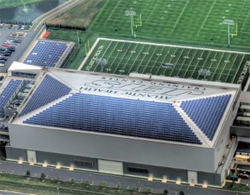 Jets have placed more than 3,000 solar panels on the roof of their team headquarters and training facility located in Florham, Park, New Jersey. The new solar system will provide the facility with 750,000 kwh of energy annually, saving the team tens of thousands of dollars. The project will reduce CO2 emissions by 540 MT a year, about the equivalent of taking over 100 cars off the road A statement by team official says that “this project is the first of many green initiatives on behalf of the team, and we are proud to be green in color and also in deed.” Im traditionally a Steelers fan but in this case…GO Jets!!!! In light of the excitement on campus yesterday, I thought this would be the perfect opportunity to explore natural gas. Natural gas is found in 33 states. The dark blue states on this map show you where large amounts of natural gas are extracted. In the medium blue states, moderate amounts of natural gas are extracted. And in the light blue states, just a little natural gas is extracted. Natural gas is not extracted at all in the states that are white. Natural gas, a fossil fuel, is more environmentally friendly than other fossil fuels (besides carbon dioxide and water vapor) it does not release any other harmful substance, into the atmosphere. Existence of natural gas was known to people of ancient Greece, India, and Persia, in the form of burning springs. These springs were created when fountains of natural gas, seeping out from cracks in the ground, were ignited due to lightning. Natural gas was used for the first time in the US in 1816, to light street lights in Baltimore. Natural gas is third most widely used fuel in the US, after petroleum and coal. Natural gas is naturally colorless, odorless, lighter than air and non-toxic. Despite its various uses one of the major disadvantages of natural gas is that it is highly combustible, due to which explosions are very likely. By itself, methane is odorless, colorless and tasteless. As a safety measure, natural gas companies add a chemical odorant called mercaptan (it smells like rotten eggs) so escaping gas can be detected.